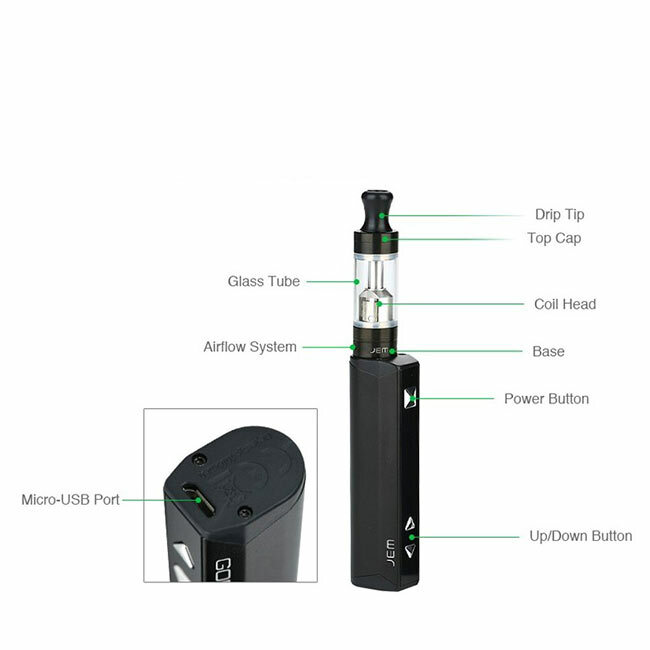 The Innokin Jem Vaping Kit is easy to use, small scale mod device for mouth to lung vaping. It is an ideal partner for anyone serious about quitting smoking. The Jem features a powerful 1000 mAh capacity rechargeable battery which has a 5 stage adjustable wattage control system between 10-13.5W. Low wattage gives a cooler vape and prolongs battery life whilst a higher wattage gives more cloud and flavour. The Jem Tank has a 2 ml capacity, is top filling with adjustable airflow and houses a 1.6 ohm replaceable Jem coil. This is our small scale vape mod of choice giving you unparalleled reliability from a very small yet practical device. The Jem by Innokin is a fantastic mouth-to-lung flavour kit, and even allows you to change your wattage to find the perfect power level for your e-liquid of choice. Choose from power settings of 10W, 11W, 12W, 13W and 13.5W; to change the wattage, use the arrow keys on the front of the device. A clear, easy-to-read display shows you your wattage level and remaining battery life. The Innokin Jem has a slim stainless steel body housing a 1000 mAh battery and comes with a durable Pyrex tank with a simple top-fill system: just unscrew the top cap to access the Jem Tank’s filling slots, and fill with your chosen e-liquid. Replacing the 1.6 ohm Jem coil is just as straightforward: twist off the base of the Jem tank and you’ll be able to unscrew the old coil quickly and easily. The Innokin Jem features an adjustable airflow ring situated at the base of the tank to allow you to tweak your draw; whether you’re looking for a tight, cigarette-style draw or an airier inhale, the Innokin Jem has you covered! When the battery runs low, you can recharge the Jem using the Micro USB cable supplied alongside the kit. Your Innokin Jem device is manufactured with precision so will not leak providing you use the product and parts correctly. Where any leaks have occurred, we have solved almost all by taking the following steps. When setting up your Innokin Jem it is important to ensure you obtain the correct temperature to vape a given e liquid. Different e liquids have different properties so some need a higher temperature and some a lower temperature. In order to get the "sweet spot" we suggest starting at the low setting and increase that in steps. At one of the 5 power levels the vapour will feel warm as you inhale and this is the approximate optimised temperature. If you change e liquids or coil resistance you will then need to repeat the steps above to ensure you are hitting the e-liquid at the right temperature. When using a new coil you should always allow the e liquid to be adsorbed by the coil, leave for around 5 minutes after replacing the coil and ideally start the coil at the lowest setting for the first 3 or 4 puffs. This will allow the coil and e liquid to reach optimum working temperature and ensures a longer life for your coil. Innokin is known worldwide for leading brands such a Cool Fire, iClear, iTaste, Proton and Lily. The new Jem mini mod device showcases their innovation. Innokin is constantly at the forefront of innovations in electronic cigarette design and function and with over 150 patents. Innokin is accepted as an international pioneer. The advent of the classic "Cool Fire 4 Plus" put the Innokin brand firmly on the map and now with the introduction of the ground-breaking Jem device and Proton coupled with the Scion 2, Innokin is set to continue as a world leader. The Innokin Jem Vape kit is set to be the UK's leading high specification MTL small scale vape device. Innokin Jem reviews are now on-line and are outstanding!